WestHash is crypto currency cloud mining service just like its big brother NiceHash. It offers users the same functionality to either sell their hashrate or buy hashrate for the supported algorithms such as Scrypt, SHA256, Scrypt-N, X11, X13, Keccak, X15 or Nist5 as NiceHash does. WestHash is a geographically separated system, running as a whole under global NiceHash master system (our review of NiceHash). WestHash does have an independent market, however accounting, payments and everything else is fully integrated into a single system. WestHash brings are more attractive opportunities for hashrate providers as well as for hashrate buyers, even though the market is located in US West is optimal for hashing power sellers and buyers located in US, Canada and other near regions. While NiceHash is located in Europe and is optimal for hashing power sellers and buyers located in Europe, Russia and other near regions. 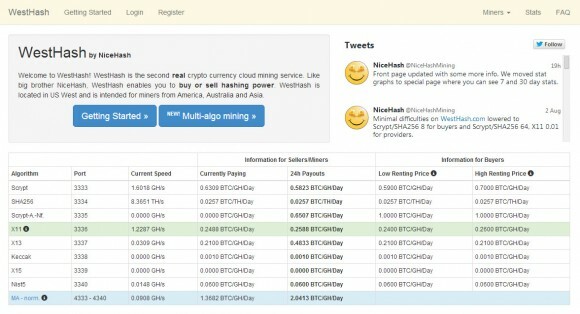 This does not mean that you cannot use both services, regardless of your location, in fact if you have already registered on NiceHash you can already use your existing account to buy hashing power on WestHash as well. The fact that the two websites have separate markets means that you might get good opportunities for either buying or selling hashrate at either of the two services, so you may have better opportunities to make something extra if you keep an eye on the prices in both places. Nicehash needs to expand with more geographically disperse servers and also needs more servers to handle the high loads. Creating a whole new system is the least smart way to do this. Pretty much all other multipools manage to have several stratum servers for the same system. This creates two competing markets. Do not want. I wish your blog was at least a tiny bit critical. It would be nice if a program like NiceHash Control would be updated to support mining at Nicehash or Westhash depending on price. I think this would help balance the price between the two sites buy may cause issues with server load. We are not critical of the approach as it creates opportunities for the users of the service, both buyers and sellers… and this is good, especially if it can be automated to always find the best price for the user – sell hashrate where the price is higher and buy where it is lower. Sure it segments things, but in the end the disadvantage could be for the service operators as they create internal competition for NiceHash, but again we see this as a good opportunity for the users. You should be critical. A LOT! How come all the comments are critical but yours? !